The beginning of another year and a time to make plans to map out your powerful life! My parents were my GPS that guided me on a positive path but along my journey there were other motivational people whose purposeful life continue to be a powerful beacon in my life, today. 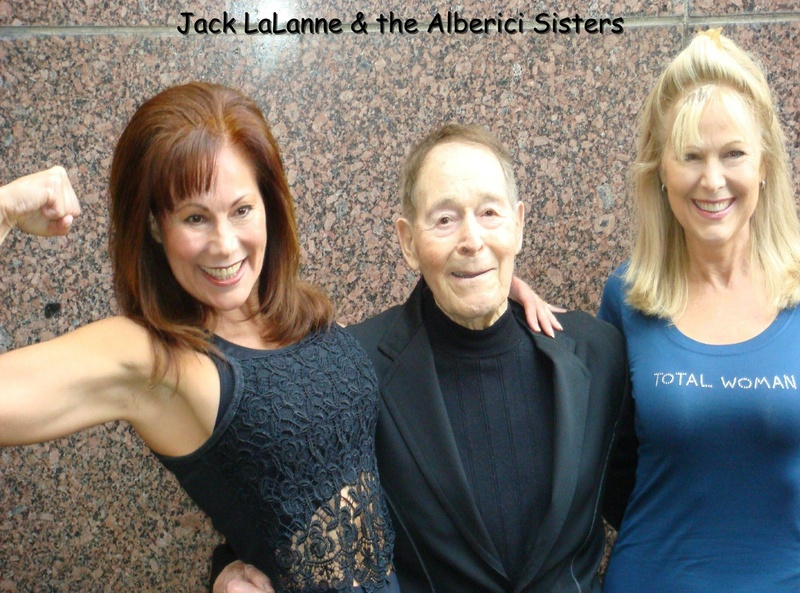 My sister and I, Alberici Sisters, grew up watching Jack LaLanne on TV. The Jack LaLanne Show was the longest running health and fitness show in history, airing from 1951 to 1985. Recently, my sister, Linda Eichberg and I sang “Happy Birthday” to Jack LaLanne for his 95th birthday and led participants in 95 “Jumping Jacks” at the Los Angeles Council Chambers. Our enthusiasm shook up the room and Jack’s sense of humor had us all laughing. Now, that’s a prescription for good health! Jack LaLanne’s TV show inspired my family to keep healthy and fit. Coincidentally, both my father and Jack LaLanne suffered through illness when they were young boys. That motivated my father to raise his big family of nine children on fresh squeezed vegetable juice and daily exercise. We kept these healthy family values, even before it was popular. Being children in the 1960’s, we suffered ridicule from our peers for bringing whole wheat bread to school. This was during the ‘wonder bread’ or white bread era. We were not rich but my father and mother were diligent in their struggle to feed all their children healthy and wholesome food. They often told us, “You are what you eat” and “Health is wealth.” These statements were a positive influence that guided me to be the first woman to win two National Fitness Titles, all in one year. Governor Arnold Schwarzenegger, a former Mr. Olympia was one of the judges and handed me my trophy. POWERFUL EVENTS: I’ve been blessed to have had the inspiration of “Power People” touch my life. Another fitness pioneer is Joe Weider. Recently, I was pleased to be one of the speakers to share the podium with Joe at the first National Fitness Day in LA., a part of the Shape Up America Campaign held in Los Angeles, California. SHARING FITNESS VALUES TODAY: Continuing my passion for fitness, I’ve extended my expertise as an on-staff Lifestyle Educator at Kaiser Pemanente where I teach exercise classes. According to a joint ranking by U.S. News & World Report and the National Committee for Quality Assurance, we offer the top-ranked health plans in the nation in both Medicaid and Medicare. Become the change that you want to see in your life. Strive to be consistent, trusting in the power that created you. Nobody is perfect, so there will be little failures and little successes, even little miracles. I believe in miracles. Do you? Beyond Our Wildest Dreams, tells the story of two sisters growing up with healthy values and entertaining with showbiz icons that include the Rat Pack. 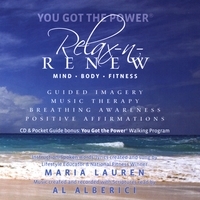 Book Maria Lauren or the Alberici Sisters for personal appearances entertaining audiences or book signings. This is a blog about LIFE: Living, Inspiration, Fitness, Entertainment. It is produced in my own time and solely reflects my personal opinions. Statements on this site do not represent the views or policies of my employer, past or present, or any other organization with which I may be affiliated. All content is copyrighted. Hello Maria – Thank you for the article on the great Jack LaLanne. Since Jack lived on the Central Coast of California, I was fortunate to meet him on a couple of occasions. Jack’s good friend from childhood, Dr. Bill Parker, DVM and Jack continued to swim together each morning at the pool at Morro Bay High School. I believe they did this well into their 80’s. Sadly, both Jack and Bill are now gone. I have a delightful story that will remain with me for life. We were at a birthday party for Bill Parker at their ranch in Morro Bay. Jack and his wife Elaine were there and of course Jack was the center of attention. I wanted to ask Jack about a nutrition plan for my young son who was a high school distance swimmer. There appeared to be no way I was going to get past the hordes of people talking with the “guru of fitness”. Then I saw his lovely wife, Elaine and I had an idea. I walked up to Elaine, introduced myself and told her that as a young child, I watched my Mom exercise to Jack each morning via KPIX TV in San Francisco. I told her I was most interested not in Jack, or his white German Shepherd’s, but rather his lovely exercise assistant, Elaine Doyle. She kind of smiled and said, “You remember me as Elaine Doyle?” I told her I did and I also remembered her part in a commercial for Eucalyptus Soap. She washed the hair of former Tarzan, Lex Boyd right on the T.V. Well, she was amazed, and quickly grabbed my hand, took me right to the front of the line, and said, “Jack, this young man remembers me as Elaine Doyle.” She made certain he discussed my nutrition questions with me, then proceeded to take my arm and introduce me to everyone at the party. What a great moment in my life, and she was such a wonderful, gracious and spirited lady. Jack actually gave me his phone number and told me he would like to work with my son, on his plan. Sadly, we were never able to do so, but I will never forget that moment with this most amazing man who only knew how to live his life from a positive perspective, and his charming wife. That day created a life time memory for me. Thanks to Your Powerful LIFE for bringing us your wonderful story about Jack and your family. Thank you for your inspiring and heart warming story about Jack LaLanne and his wife, Elaine. When my sister Linda Eichberg and I met Jack LaLanne and his wife, we came away thinking how lucky he was to have such a classy wife. She suggested to her sons that they give us some of her special facial cream. We were glad to receive it because she looked great! Michael, good luck with the launching of your book of poems called, “Positively America” and staying on the positive path! HE WAS ASKED BY A MONEY POWERHOUSE ABOUT HIS NEW JUICER THAT MUST BE MAKING A MINT. HE OVER LOOKED THE THOUGHT ENTIRELY TO SAY HOW MANY PEOPLE ARE HELPING THEIR HEALTH…………………. . 1996 . You’re so sweet. You always said that Jack LaLanne reminded you of our dad. Dad certainly believed in freshly squeezed vegetable juice and fitness. Susie, you’ll always be a special part of our “Golddigger family.” Love ya! Thank you for the article on Jack LaLanne. What a positive influence this man has had on this country. I use to work out to his TV program when my children were babies. When they started school I joined one of his gyms. May God bless him, and his family. God bless you and your family too. From coast to coast … Hi! Where would we be without the motivational people who touched our lives? Dad was dynamic in his passion for teaching us the value of health and fitness in our lives, while it was Ralf Pepino’s idea to act as my fitness trainer and enter me into the national contests. They gave me the tools for the winning formula and mom’s genes didn’t hurt either! Our whole family were pioneers in healthy eating and for that we can be proud, even grateful. Although at that time, people did not understand our strict diet: no candy, no white flour or white sugar, no meat … with a big yes to: fresh fruits and vegetables, raw nuts, beans and whole grains. Thanks for your sisterly support! Sharing family, friends and a life filled with fitness and entertainment adventures, has been a blessing. Welcome to Your Powerful LIFE blog! WHAT MAKES A LIFE POWERFUL? This Blog is a place where I explore that question. I invite you to join me on my journey as I celebrate Positive Living, Powerful People, Peaceful Places, Playful Pleasures and the Divine Power that lights my path. The road of life is not always smooth, that’s for sure! Thank you for visiting. I look forward to your thoughts. Alberici Sisters – authors of the 70’s pop-culture book! I am an ordinary woman who has lived an extraordinary life... During my life, I have performed many roles, both on-stage and off-stage. I'm grateful for my on-going practice as a HEALTHY LIVING FITNESS INSTRUCTOR at Kaiser Permanente Medical Center. My credentials as a two- time national fitness award winner and co-author of the book, 'Beyond Our Wildest Dreams' has led me to make appearances as a MOTIVATIONAL SPEAKER regarding the topic, 'You Got The Power!' As a MULTI-MEDIA ENTERTAINER, I have traveled internationally performing with my sister, Alberici Sisters, and legendary stars including members of the original Rat Pack. My FAITH, family and friends are important to me. "Your Powerful LIFE" are posts about Living - Inspiration - Fitness - Entertainment! 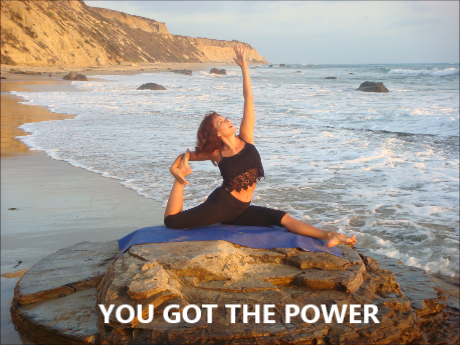 YOU GOT THE POWER®. Blog Achievement! Click emblem for BLOG INDEX!